Will Johns Island be able to maintain its traditional character while allowing reasonable development? Why has the Island always been a desirable place to live? What are the things that make this such a special place? How can we make these things economically sustainable? Who are the people who know how to do this? See our full report, “Growing a New Johns Island“, including interviews with some of those who have worked tirelessly to make a new Johns Island work. Chicks Fly the Coop ! 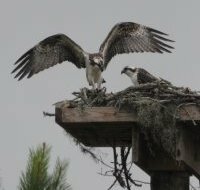 Right on schedule the Osprey chicks at Legare farms have started flying. While they are not yet ready to hunt on their own they are making longer and longer excursions away from the nest. See our full post for more information and pictures.